The Leyland Atlantean was the first successful rear engined bus design to be developed, like the Daimler Fleetline that appeared shortly after, it was a popular choice, of what has become known as the first generation of rear engined buses. The Atlantean remained on Leyland books for well over 20 years with the last examples appearing in the early 1980's, in all over 15,000 examples were built. 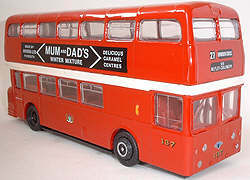 MCW were one of the first body builders to offer bodywork for this new type of bus, however in the life of the Atlantean most body builders supplied bodywork at some time or other. During the mid 1960's London Transport carried out trials of both the Atlantean and Fleetline, both versions being bodied by Park Royal with bodywork closely resembling the MCW design. 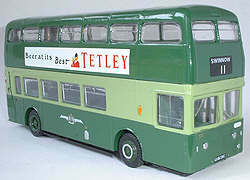 The 50 Atlanteans bought by LT formed the XA class, following the trials LT decided to adopt the Fleetline as their standard rear engine type, the 50 XA's were withdrawn and all subsequently ended up in Hong Kong. The only differences between the Park Royal and MCW versions of the model can be found in the rear engine bustle castings used. The Park Royal version has additional side shrouds giving a smooth rear profile. The MCW model was launch into the range during December 1993 followed six months later by the first Park Royal version.